In a televised new year speech, he said the entire US was within range of North Korean nuclear weapons, adding: "This is reality, not a threat." But he also offered a potential olive branch to South Korea, suggesting he was "open to dialogue". North Korea may also send a team to the Winter Olympics in Seoul, he said. 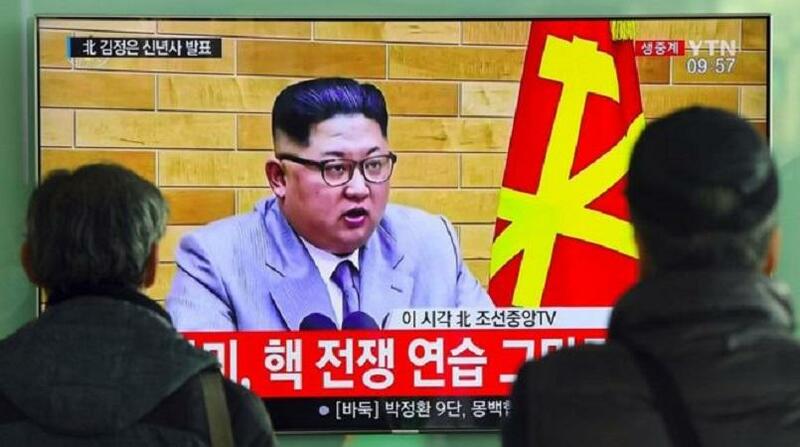 North Korea has come under increased criticism and sanctions over the past year because of its nuclear weapons programme and repeated testing of conventional missiles. It claims to have a fully deployable nuclear weapon, though there is still some international scepticism about its true capacity to carry out such an attack. While his language against the US remained tough, Mr Kim did not employ his typically antagonistic tone when speaking about his neighbours in South Korea. "The year 2018 is a significant year for both the North and the South, with the North marking the 70th anniversary of its birth and the South hosting the Winter Olympics. "We should melt the frozen North-South relations, thus adorning this meaningful year as a year to be specially recorded in the history of the nation," he said. A spokesperson for the South Korean president said their office had "always stated our willingness to talk with North Korea at anytime and anywhere".